The dumbing down of the human population had already gone far enough, cheered on by the humans themselves, pushed on through monopolised, corporised and controlled media, so the animals actually did not have to do anything about the intelligence issue to be able to outmanoeuvre the humans. It was an inventor who discovered a way to make animals super-intelligent and united that finally created lovely results. The animals were already much better than humans in many interesting ways, like sense of smell, sharp vision, camouflage and speed so the rest was relatively easy. Most animals were actually nice about the whole thing, when they took over mother earth, so they decided to lower the number of the human species in a very discrete “human” and painless way. Sure. The animals knew about human entertainment. They had been part of it for a while, of course without their prior consent. But this was actually not the issue. No, you see, the real problem and the cause for the rapid human down-growth and included entertainment, were NOT, in any way, connected to the awful crimes against animals that many humans committed. No. The animals themselves did not see cruelty as a serious problem. The law of nature was sometimes much more cruel than the average human was capable of and the poor health humans got from eating too much meat and non-organic was punishment enough in most animals opinion. Instead it was about a far more serious thing than that. Yes. It was about MOST HUMANS INABILITY TO UNDERSTAND THE EXPONENTIAL FUNCTION AND THE CONSEQUENCES. Yes. It was, simply put, about “the impossible human hamster“, the population elephant. that can’t grow forever. Some humans called it “economical growth”. Other more religious oriented called it a “Gods blessing” and Lions and Tigers were not allowed by the ignorant humans to balance the population even if they really wanted to. So, the human population growth simply threatened to deprive mother earth of too many species and leave a vast grass land in its tracks, just like had happened before on Easter island. Some of the more healthier humans had even invented hydroponics and become vegan to postpone the total distaster waiting around the corner, but sadly, only a few of them had the ABILITY TO UNDERSTAND THE EXPONENTIAL FUNCTION AND THE CONSEQUENCES. Generally speaking, the vegans were like emotional and strong elephants but with all to little ability to comprehend the obvious. Believe it or not! The method of execution was simply chosen to make the necessary event, a happier event, that could give the bystanders, who DID understand the exponential function, at least a half-smile in midst of the tragic. For carnivores with a special taste for certain parts, and who did understand the exponential function, it was a real feast making the rapid down-growth happen. The ones with weak nerves who did understand the exponential function were naturally allowed to have alternative parties, in line with restoring the planet, during these events. They were foremost vegans naturally. 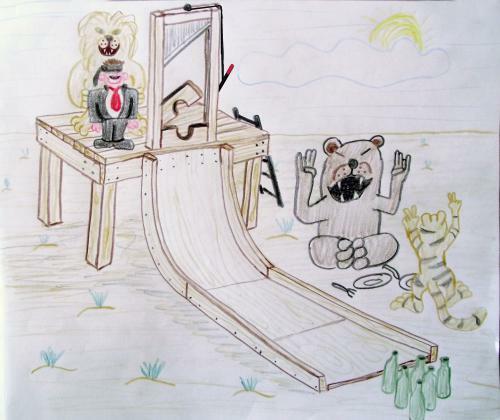 The execution method was actually donated to the animals as a gift from Intelligent Union – The network for intelligent politics. The animals gave VIP-status to the few people who at least were clever enough to join Intelligent Union and actively try to enlighten other humans about the nice solution of the problem. The VIP-status included special allowance to make a lot of intelligent humans, that according to the plan, should be able understand the exponential function in the future and the need for balance in nature. * Correlation in name, or growth jibberish, with politicians, such as for example Håkan Juholt, is naturally a pure coincidence. Copyleft intelligentunion.wordpress.com – Copy, trackback, spread and publish as you please!